Pixar could be accused of creating a cheap cash-grab sequel with Cars 2. 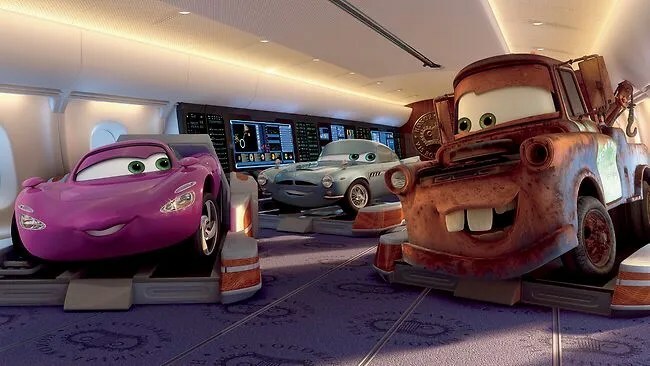 Cars wasn’t the greatest of Pixar movies and certainly wasn’t critically acclaimed but it did make a huge amount of money, particularly in merchandise, so a sequel seemed inevitable. The question is how you build upon a story as clearly complete as Cars, with Lightening McQueen learning the error of his selfish ways and embracing the help of friends and teamwork. The answer is go in a completely different direction. Rather than tell a straight racing/sports story, instead create a spy movie which has more in common with The Man Who Knew Too Little than it does with the previous movie this is a sequel to. It is a bold move and unfortunately for Pixar, it has mixed results. The premise starts well, with McQueen being coaxed into a Racing World Tour (which only covers three races in three separate countries so is hardly a World Tour of any expanse) and deciding to take along Mater as his adviser and race chief. This is hardly surprising as Mater was one of the better and more popular aspects of the first movie so to shift focus towards his character seems like a natural progression. In fact, this is arguably Mater’s movie as he gets much more screen time than original hero McQueen. His story is also an intriguing one, being roped inadvertently into a spy mission involving a deadly new bio-fuel that could have lethal results for the World Tour that his best friend is involved in. This means that Cars 2 gets the opportunity to riff on plenty of cliched spy-tropes fairly successfully. Everything from code-words, illogical gadgets and cool action sequences are references and used and at times it makes Cars 2 a very exciting movie and very different type of film to the first. Add character support from Michael Caine as Finn McMissile and Emily Mortimer as Holly Shiftwell and you get a spy movie that parodies the likes of James Bond well. Unfortunately, Cars 2 doesn’t commit enough to this plot. There is a below-par sub-plot that involves Owen Wilson’s McQueen struggling to cope with the absence of Mater. The racing scenes are decent enough but McQueen’s plot is the weaker of the two. There are some very good aspects, particularly when we see cultural touch-points from the likes of Japan, Italy and Britain told through the well-realised world of Cars. As these scenes play-out though, you can’t help but want to get back to the spy-plot and the funnier moments involving Mater. Larry the Cable Guy is back on voice duties for Mater and provides the funnier moments. He is a very well-crafted character; being just stupid enough but with a big enough heart that his ignorance gets him into scrapes that his luck can get him out of. They make for some of the better moments of the film, particularly a solid finale which has some suitably stake-raising consequences. Overall, Cars 2 is a good attempt to build the Cars world further without retreading what has gone before. It shifts the focus to one of the better characters from the first film but to the detriment of it’s actual star McQueen. It is a good parody of a spy movie but Pixar can do so much better.